Preheat your oven to 350°. Rinse and dry the apples. Using an apple corer, cut out the cores. Place apples in a pyrex baking pan or cookie sheet with a lip. Coat the apples in extra virgin olive oil. 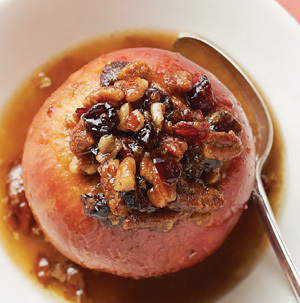 Place the walnuts and dried cranberries in the center of the apples. Then, dowse apples in cinnamon, 1 teaspoon is a guideline, but you can feel free to use more! Bake the apples until they start to burst and fall. This should take roughly 45 mins. When done, remove the apples from the oven and baste them with the juices from the pan. Serve with vanilla ice cream and enjoy!